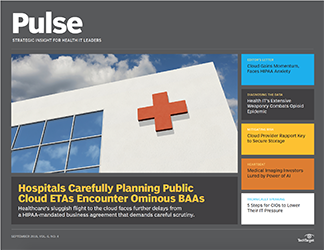 Applying public cloud to healthcare can create a brave new world for hospitals. The CTO of Providence Health & Services strongly advises reading the healthcare BAA very carefully. Conducting a risk assessment before moving to the cloud and establishing security controls when you get there are key steps toward achieving cloud security, experts say. Investors in medical imaging technology leaned toward software that improves AI-related radiology and associated workflows, as evidenced by detailed research.